Being a kid can be so hard, parents just don't understand. Heard that line before? My family and I attended an advanced screening of this movie for review. All opinions stated are my own based on my personal experience. When we are kids, we do not care what our parents are telling us. They just do not understand. When we grow up, we realize our parents were right all along the way. My wish for my kids is always to find a happy medium. I am their mother. Some lessons are hard to learn. As parents sometimes we want to catch our kids every time they are about to fall, but we cannot always be there. We hope that all the lessons we teach will stick with them on the times we cannot be there. Road trips always start of as great ideas but sometimes are they? SYNOPSIS-In DIARY OF A WIMPY KID: THE LONG HAUL, based on the record-breaking book series, a family road trip to attend Meemaw’s 90th birthday party goes hilariously off course--thanks to Greg’s newest scheme to (finally!) become famous. 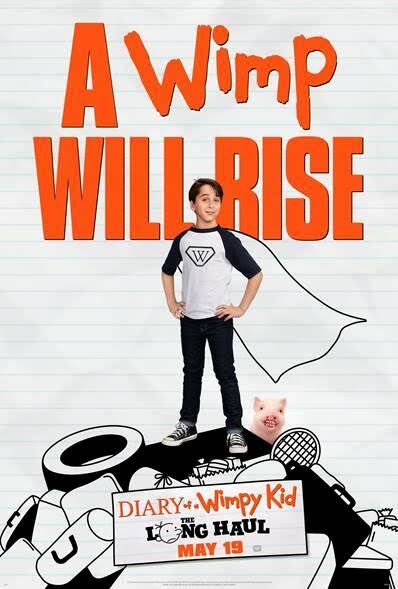 Diary of a Wimpy Kid-The Long Haul comes out today. Grab your kids and make them go to this movie. 'Cause it is oh-so-good. Hits it right on the nail. Perfect for the family to unwind. My oldest loved reading these books as a kid and now little bear gets a kick out of them too!